Editor’s note: This is the fourth in a series of pieces focused on Hartford and its regional identity which will be posted before and during the NCPH annual meeting in Hartford, Connecticut in March. Five years ago, the Central Connecticut State University (CCSU) public history program began a partnership with the Connecticut Historical Society (CHS) Museum & Library in Hartford to produce exhibits with its museum studies graduate classes. This university-museum relationship, coordinated by assistant professor dann j. Broyld and exhibit developer Ben Gammell, has been mutually beneficial, yielding several traditional and traveling exhibitions as well as internships and employment. The shared objectives of CCSU and the CHS of community engagement, professional development, and cutting edge design has resulted in great synergy. 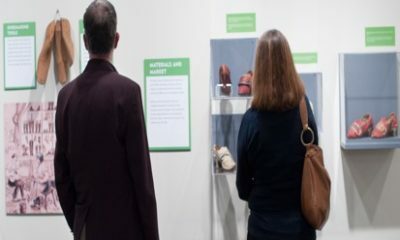 The professional collaboration got underway with The Sole of Connecticut: A History of Connecticut Shoes exhibit in 2016. It was followed up by two exhibits that are touring select sites throughout Connecticut. 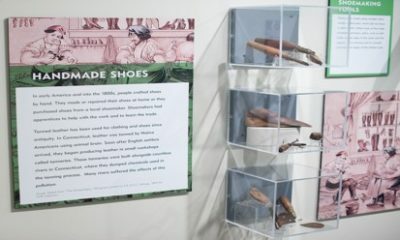 Students adapted the 2015 CHS exhibit Connecticut: 50 Objects/50 Stories and a popular educational program Tories, Spies, and Traitors: Divided Loyalty in Revolutionary Connecticut into mobile panels which will reach a larger audience outside of CHS’s walls. Also on deck in the Rebuild via Home Run exhibit are discussions of integration, ethnic diversity, women’s softball, and the impact of baseball on urban development. Baseball has kept “Nutmeggers” active, healthy, and entertained for a score of generations and the game is now seeking to aid in the revitalization of downtown Hartford—without striking out. Connecticut baseball is as old as the game itself. 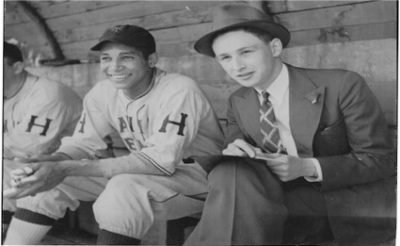 By 1862, many local towns (including Waterbury, New Britain, and Hartford) created their own amateur clubs and semi-pro and minor league baseball were a constant presence in the state since the mid-1800s. Playing their first game in 1874, the Hartford Dark Blues helped to establish the National League, forerunner to Major League Baseball, in 1876. Players including Babe Ruth, Ted Williams, and Johnny “Schoolboy” Taylor took to the diamond in Connecticut. In June 2014, Hartford announced that minor league baseball would return to the city. Talks about relocating the nearby New Britain Rock Cats began immediately since their contract was scheduled to end in 2015. By October, the Hartford City Council voted to construct a minor league baseball stadium in the Downtown North (DoNo) and the Rock Cats prepared to move. The Downtown North is a historically diverse neighborhood that has struggled with poverty, lack of resources, and vacant lots. 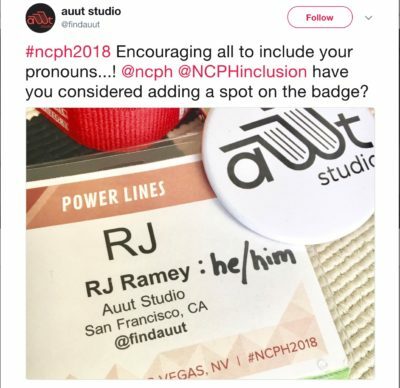 The community is not far from the conference center where the NCPH annual meeting will be hosted. The ballpark’s construction faced a score of issues. 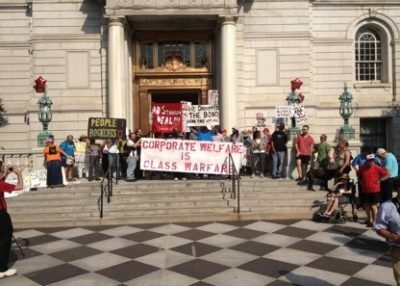 Local residents of Hartford flooded the steps of City Hall to protest the building of the park, the Rock Cats’ relocation, the lack of minority contractors, and the cost to the public of the $60 million stadium. In 2014, protesters, known as The Hartford Coalition to Stop the Stadium, lined Main Street in Hartford arguing that other issues like schools and the state’s budget should take precedence over a stadium. At another protest, multiple arrests were made. The stadium protests delayed the Dunkin’ Donuts Park project to the point that it was not ready for the 2016 opening season. Originally affiliated with the Boston Red Sox and later the Minnesota Twins, the Rock Cats had been playing their home games at New Britain Stadium since 1983. 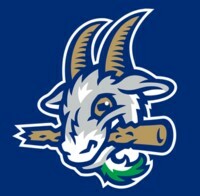 When they made their contentious move to Dunkin’ Donuts Park in Hartford before the 2016 season, they became the Yard Goats, an affiliate or “farm club” of the Colorado Rockies. I am sure you’re thinking: What is a Yard Goat? It is rail-yard slang for switch engines that shuttled train cars between locomotives. The team name was selected by some 35,000 voters that cast a ballot, choosing from the River Hogs, Hedgehogs, Whirlybirds, Praying Mantis, and Yard Goats, the winning name. As for mascots, the team has two: a green male goat named Chompers and a blue female goat named Chew Chew. The team colors pay homage to the Hartford Whalers, who played in the National Hockey League from 1979 to 1997 and are still beloved all over Connecticut to this day. The Yard Goats’ ballpark was completed for their home opener on April 13, 2017, which they lost to the New Hampshire Fisher Cats (7-2). 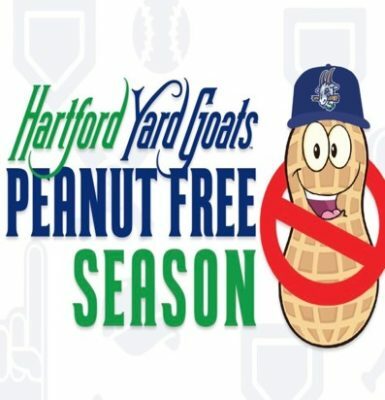 Recently, the Yard Goats and Dunkin’ Donuts Park have made national news by announcing that “peanuts and Cracker Jack,” memorialized in Jack Norworth and Albert Von Tilzer’s 1908 classic song “Take Me Out to the Ball Game,” will not be sold or allowed into the stadium. This ban will hurt profits at the concession stands, but peanut-free games will ensure that fans with peanut allergies are safe. Other professional sports teams have held an occasional peanut-free game or have stadium section where nuts are not allowed. 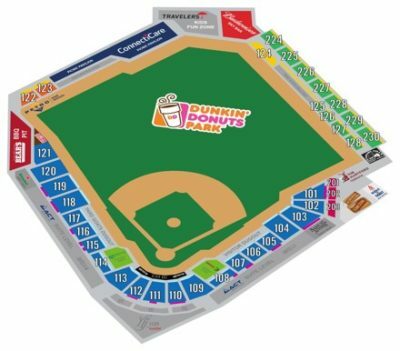 However, Dunkin’ Donuts Park is now leading this progressive conversation and endeavor to make games more accessible. The Yard Goats allowed community members the opportunity via social media to rewrite the lyrics that will replace “buy me some peanuts and Cracker Jack.” The winner, JJ Pabst (whose winning entry was “buy me a hotdog and Yard Goats cap”), will lead fans in singing the new rendition of the song on opening day on April 11, 2019. Unfortunately, the RvHR exhibit panels were already set to print before the peanut-free initiative and song information could be added. This is a lesson to students of public history that the discipline is always in-progress and not every topic will make it on base. In all, the CCSU Program centers the students, they developed Rebuild via Home Run’s inclusive storyline, engaging questions, interactive elements, and digital content. RvHR caused the students to address issues of integration, gentrification, and historical preservation. The professorial and CHS design team simply provided the graphic aesthetics and polished the final exhibit script. Community partnerships have been central to the success of students at CCSU. The CCSU public history program strengthens the relationship between students and the community by supplementing classroom learning with practical skill building. ~dann j. Broyld is an assistant professor of public history & African American history at Central Connecticut State University. He earned his Ph.D. in nineteenth-century United States and African Diaspora history at Howard University. His work focuses on the American-Canadian borderlands and issues of Black identity, migration, and transnational relations, as well as oral history, material culture, and museum-community interaction. Special thanks to the CHS and all the students in my CCSU 2018 Museum Studies class! ~Chelsea E. Echevarria is a second-year graduate student in the public history program at Central Connecticut State University. Dann & Chelsea: Great stuff, but did you know that the song, “Take Me Out to the Ball Game” was really a Women’s Suffrage song?